On a lake of icy blue silk velvet a turtle glitters. It is made of tiny glass beads in the Iroquois style so that it is embossed or raised. Beaded trees stand bare; they ring the lake where the turtle swims. The deep silence of winter hangs in the air. "Wampum Urn" by Karen Ann Hoffman. Photo by Mike Hoffman. Used by permission. The turtle is a symbol of the Oneida origin myth. Earth was formed by the Creator on the back of a turtle. Hoffman is a member of the Turtle Clan, a clan descended from that animal, and passed down through the maternal line, a line of women. Every aspect of Hoffman’s work holds meaning, down to the backing of calico on each piece of raised beadwork. When the Iroquois signed a treaty with the Dutch, they received calico cloth; the Treaty of Canandaigua (1794) with the United States stipulates an annual payment of cloth, “yearly, forever”. Each fall, the United States government sends cloth to the Six Nations in New York and a cash equivalent of $1,000 or so to the Oneida Nation of Wisconsin. The calico backing and the raised beadwork bring together European and Native American traditions. Hoffman is in a line of artists. As a young woman, she beaded basic items. Later, in 1999, Sam Thomas and Lorna Hill, master beaders from Niagara Falls, Ontario and members of the Cayuga Nation, one of the Six Nations of the Iroquois confederacy, visited the Oneida. That is when Hoffman became serious about learning the techniques, history, and traditions of Iroquois raised beadwork. She has seen examples that are more than 150 years old. As she beads, she can hear the old people who beaded so long ago whispering to her, encouraging her, talking to her. She wants to be welcomed when she dies by the “old women who pick strawberries”, the ancestors who prepared the way for her, just as she prepares the way for the next generation of beaders. Hoffman honors the traditions of her people in her designs inspired by the traditional Iroquois world view and executed in materials of the highest quality: custom-dyed silk velvet, tiny Czech beads, and sometimes even hand-printed calico. Wednesday evenings, Hoffman welcomes apprentices to teaching sessions at her home. In 2013, Hoffman and apprentice Roderick Elm won a competitive year long Folk Arts Apprenticeship Grant from the Wisconsin Arts Board funded by the National Endowment for the Arts. Elm, too, will take his place in the long line of artists and hopes to pass the tradition on when he becomes is a master beader. Hoffman exhibits and speaks across the United States. The Wisconsin Arts Board recognizes Hoffman as a master artist. Her best-known work, “Wampum Urn”, a three-sided urn in plum velvet lined with white satin and beaded in glass seed beeds, wampum, and amethyst, resides permanently in the collection of the Smithsonian Institution’s National Museum of the American Indian. It depicts Peacemaker and the gift of wampum to the Iroquois people. “My designs are not a commodity,” Hoffman says, working on a large piece depicting a pileated woodpecker on a birch branch. “They come from within and were inspirations. My designs and my work are a tribute to my people and their traditions, which go back thousands of years. My work is not a craft, which is a design or motif that can be repeated over and over and commercialized.” The woodpecker is coal-black, gray, with a vermillion tuft and a hard, sharp beak of smoky-clear beads. 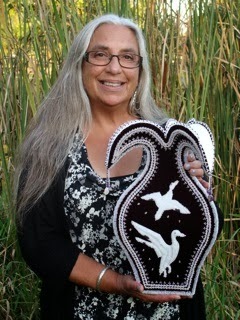 The bird and its beaded branch connect to a specific Iroquois story. With the help of a magic arrow, a woodpecker’s feather bound to its shaft, a boy killed a monster and saved his village. It is technique that allows the bird and its branch to unfold their beauty in beads, explains Hoffman, cutting interfacing to sandwich between the beaded front and calico back. Beauty comes from the artist, yes, but also from tradition, spiritual values, and the meaning that they convey to others. "TreatyRights Footstool, Walleye Spearfishing" by Karen Ann Hoffman. Native American art is typically exhibited in museums of anthropology or natural history or in segregated museums or galleries. It is often understood as folk art, operating outside of the Art Establishment and not made as something separate from daily life by trained artists but primarily as utilitarian or ceremonial objects by artisans with little or no formal artistic background. That is not a distinction that applies, Hoffman believes. She knows that her work is as much Art as anything from Western culture. She is disappointed that her work and others like it is displayed in separate rooms or separate museums from mainstream art. After all, Hoffman’s work speaks to a wide public. Take as an example a different tree by Hoffman. It is snow white with braided roots on a background of black velvet. The tree is the White Roots of Peace, a tree that represents the laying down of weapons centuries ago when chiefs from the Iroquois Nations decided to form a confederacy that stressed peace and harmony among the 5 Iroquois-speaking tribes at that time -the Oneida, Mohawk, Cayuga, Onondaga, and Seneca. Today, that symbol remains relevant to all. It reminds us of the need for peace and respect between the races and the nations. The Iroquois Confederacy represents those values, as does Hoffman’s work. Just as the Iroquois nations sent a group of singers and storytellers, the White Roots of Peace, around the United States during the Viet Nam era, Hoffman sends out her raised beadwork. She has a message for all of us: traditional values are relevant to the present and into the future. The painter, author, and beadwork scholar Gerry Biron has a beautiful portrait and detailed biography here. This placard by Ann Prior of the Wisconsin Arts Board, was part of "Masters of Tradition", mounted at the Dane County Regional Airport. The exhibition, co-curated by Hoffman, focused on Wisconsin's Master Folk Artists and was produced by the Airport, Tandem Press, and the Wisconsin Arts Board. 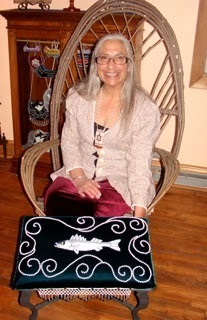 Hoffman's piece "Treaty Rights Footstool, Walleye Spearfishing" will be part of the upcoming exhibition, "Standing in Two Worlds: Iroquois Art in 2014" at the Iroquois Indian Museum in Howes Cave, New York. Hoffman is the inaugural featured Artist in the Spotlight on the museum's Facebook page. Yaw^ko for including Iroquois Raised Beadwork in Daughters of the First Nations. I am grateful to my parents, Bob and Betty Messner; and indebted to my teachers, Samuel Thomas and Lorna Hill, for all they have shared with me. I am honored to stand among the strong and intelligent Native Women showcased in this blog. Beautiful work Karen Ann! I admire you for this. Passing along traditions are very important. You look so peaceful and happy.